[2015.11.19]丘吉尔的多面人生 - 欧洲 - ECO中文网 - Powered by Discuz! No More Champagne: Churchill and His Money. By David Lough. Picador; 544 pages; $32. Head of Zeus; 532 pages; £25. Winston Churchill Reporting: Adventures of a Young War Correspondent. By Simon Read. Da Capo Press; 309 pages; $26.99. HISTORIANS and many members of the public already know that Winston Churchill often took high-stakes gambles in his political life. Some, like the disastrous Dardanelles campaign—an audacious attempt he masterminded at the Admiralty to seize the straits of Gallipoli and knock Turkey out of the first world war—he got wrong. Others, notably his decision as prime minister in 1940 to hold out against Nazi Germany until America came to rescue Britain, he got spectacularly right. But the extent to which Churchill was a gambler in other spheres of his life has tended not to catch his biographers’ attention. Two new books attempt to fill this gap. The first is “No More Champagne” by David Lough, a private-banker-turned-historian who looks at Churchill’s personal finances during the ups and downs of his career. It is the first biography to focus on this aspect of his life. Mr Lough has trawled through Churchill’s personal accounts and found that he was as much a risk-taker when it came to his money as he was when he was making decisions at the Admiralty or in Downing Street. 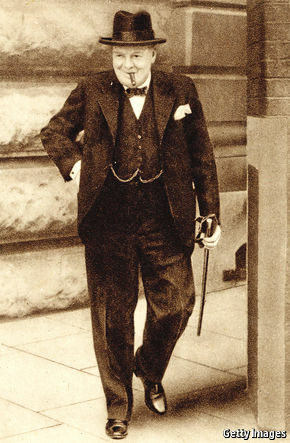 Although Churchill was descended from the Dukes of Marlborough, his parents had “very little money on either side”—though that never stopped them living the high life. Neither did it hamper the young Churchill; he spent wildly on everything from polo ponies to Havana cigars, a habit he picked up as a war correspondent in Cuba. Indeed, between 1908 and 1914 the Churchill household spent an average of £1,160 on wine alone each year—£104,400 ($145,000) in today’s money. It is no wonder, then, that Churchill spent most of his life leaping from one cashflow crisis to another, being perennially behind with his suppliers’ bills. Another new book, “Winston Churchill Reporting”, by Simon Read, an American journalist, looks at one of the ways Churchill eventually paid some of them: writing. Mr Read investigates how Churchill went from a young army officer cadet to being Britain’s highest-earning war correspondent by the age of 25, getting the journalism bug for the rest of his life. The Churchill name certainly helped open newspaper editors’ doors across London. But it was the extent to which the young reporter was willing to take risks on battlefields across the world that marked out his columns from those of his contemporaries. Visiting Cuba in 1895, during its war of independence from Spain, he travelled unperturbed through some of the island’s most dangerous territory while writing for the Daily Graphic. The next year his regiment was transferred to India, where he fought Pushtun tribesmen on the border with Afghanistan, penning articles for the Daily Telegraph from a blood-splattered foxhole on the battlefield. He was then sent to Sudan, where he took part in the British army’s last great cavalry charge, at the Battle of Omdurman in 1898. After narrowly losing a by-election in Oldham, he returned to the journalistic fray as a war correspondent in South Africa for the Morning Post during the second Boer war of 1899-1902. There he hit the front pages in his own right; he was captured by the Boers while accompanying a scouting expedition on an armoured train. Even that could not stop Churchill, who soon escaped from the prisoner-of-war camp, travelling almost 300 miles to safety in Portuguese East Africa. As Mr Read notes, by the time of his return from Africa, Churchill had saved more than £4,000 from his writing, equivalent to £400,000 today. “With judicious economy,” he told his brother, “I shall hope to make that carry me through the lean years.” But he returned to old habits in the years to come. Notable extravagances involved losing badly gambling in Monte Carlo and betting that share prices would continue to rise when the Wall Street crash hit. Churchill did not continue to write simply for adventure or fun; he did so to make ends meet. But even that was not enough. He required bail-outs from wealthy friends in 1938, 1940 and 1946 to save him from bankruptcy. Both books manage to tell their tales of Churchill the adventurer and gambler elegantly. And for a financial biography, Mr Lough’s is a surprising page-turner. But the two authors only briefly link their assessments of Churchill’s personality to the important decisions he made in office—and even then only in vague terms. For instance, both fail to mention how his frequent bouts of depression may have contributed to his impulsiveness and risk-taking. Although their stories are worth telling, they have left bigger questions about Churchill to other historians. 1）has tended not to catch his biographers’ attention. 2）But the extent to which Churchill was a gambler in other spheres of his life has tended not to catch his biographers’ attention. But the extent to which Churchill was a gambler in other spheres of his life has tended not to catch his biographers’ attention. GMT+8, 2019-4-21 05:00 , Processed in 0.114321 second(s), 28 queries .